Always try to Single yourself out – never stack with other player. Holding Shift + RMB while Evasive Explosive Shot will increase the speed between them. Keep using S+E until he reaches his 40% phase. Try to use RMB and F after this Cry – Jump – Jump – Body Slam Combo once. Once you got both of your Melee Hits keep using S+E and try to use a few Shotguns after this Body Slams – try to get 5-10 Shotguns in. Once this is done simply S+E until he is dead. Note: Make sure that you are always at his side/behind him. Should he turn in your direction use Evasive Explosive Shot to dodge Left/Right. Should you start tanking him start using Blasting Gust Cancel in Combination with S+E between his Jumps/Body Slams. Do not get overconfident against him sometimes he does rather random hits which easily knock you out of your shoes. Overall Red is simply a bad Boss in his “RNG” phase it is very hard to predict his Movement and Attacks which results in a lot of interrupted Tearing Arrow but still – once you recognize his pattern you should not die at all. Well, let’s be honest – you first attempts on Bheg will end up deadly for you. You will die a lot learning the proper position and movement for this Boss however once you got it he is the Boss you can toy with the most. Basically once you understand his Movement and Attacks you will be able to predict him so easily you could basically solo him – only Problem on that is the huge amount of HP! There are two things which greatly help on not dying against him. First – always keep your eyes on him and the direction he is looking at and second always stay on maximum range. If you stay on maximum range his Basic Attack will not hit you even if he hits in your direction while the current Tank is running around in front of you. Should you take over the role of the tank while on max range Bheg will always walk into your direction first giving you more than enough time to prepare for Evasive Explosive Shot Left or Right. While you are tanking him simply use Moving Shot in one direction while keeping some damage on him should you run into people simply Evasive Explosive over their heads. The more risky version of tanking him is using Shotgun into Evasive Explosive Shot. Try not to close in and always stay around Auto Hit Range as he will use his AoE Cleave instead of his Basic Attack if you are in range of it – and the AoE Cleave is much harder to predict. I personally do not use RMB or F against him but I try putting in +-10 Shotguns once a tank is crystallizing and his Movement becomes a lot more predictable by keeping an eye on the actual tank. You should never stay in the middle of the pond but always attack from the sides this will ensure that you don’t get blocked by other players and will allow you to deal more DMG with S+E as the more people are on one spot the more likely one of them takes aggro. This Boss is simply said free Loot. Once the fight starts close in for a few RMB + F before switching into ~15 Shotguns. Once this is done move to max range and S+E until he is dead. Please note that the first hit will kill you 99% of all time if you try to outrun it, as his initial Attack seems to get you wherever you are but directly in close range. If you want to first Hit Dimitri charge in but do not get to close as directly at his position he will deal damage as well. The only thing that could kill you while on S+E maximum Range is standing in the spawn of his adds or his huge Boulders. In case of his adds always move a nice amount into the back once he starts spawning them this will ensure you don’t get hit by the initial AoE damage and the Adds will aggro on someone else allowing you to instantly go back into damaging the Boss. In case of his Boulders there are two situations you take damage from them. The first is that the current tank is running to you – the Boulders are AoE – so you will get hit as well. The second possibility is you taking aggro. In this case simply keep Evasive Explosive while moving backwards (I recommend not stopping after all three Boulders are out). Please note that the damage of the stones will hit 1-2 seconds after the Boulder animation. In addition to that sometimes the Animation does not cover his actual Attack and you might get damage while he throw the pebble into the other direction due to that always keep an eye on his face – if he looks at you but throws a Boulder behind himself the Boulder might actually hit you. With about 1.300 HP and 128 DP + Elixir of Will I can survive two of his Boulders while daytime and instantly using a Health Potion. 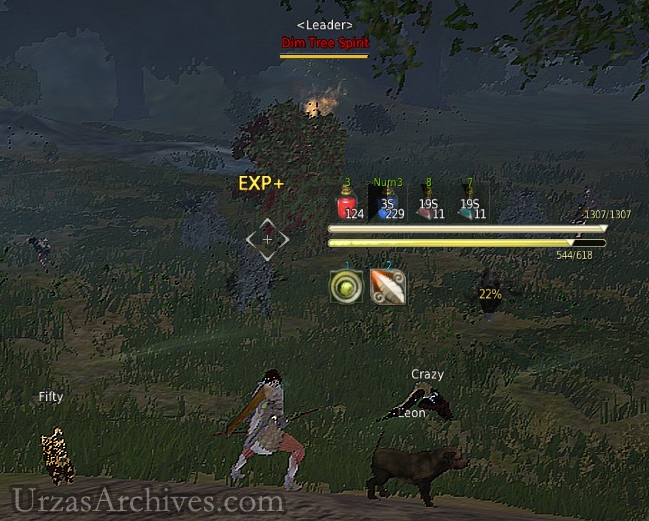 Probably the easiest Field Boss (after Kzarka) all of his Attacks are either close range or the initial animation time is long enough to run to Heidel go shopping and come back before the attack has ended. While soloing Muddin is much harder than Bheg because of his Basic Attack you can simply engage him while alone firing 3-6 Shotguns at him and outranging him completely before he starts moving. You can keep repeating this until there are 2-3 more people. Once there are enough people sneak behind him and RMB and F him before switching into ~15 Shotguns. Once that is done you can fall back to S+E range to keep finishing him from afar. It is important that you stay at max S+E range all the time. He uses two ugly range attacks a closer Ranger Mud Spike with a good sizes AoE radies and a longer range Mud Spear which is like a Shotgun attack piercing all target in a straight line. Both Attacks can simply be canceled and ignored while on max range. Please note that it is possible that a player in front of you is triggering the Mud Spear causing damage on you. To ensure not to die try to never fight with people in front of you. If he starts burrowing down while you are charging your S+E simply release it early by using LMB as you will still damage him a few moments after he burrowed in. Always try to predict where he will unborrow himself and precharge your S+E so that you can damage him the moment he is back to the surface. Should he start to Wobbel while looking into your direction instantly keep Evasive Explosive into one direction (left or right) and never stop before he is back to the surface! Let’s be honest to ourselves… this guy is by far the easiest Boss in the game. 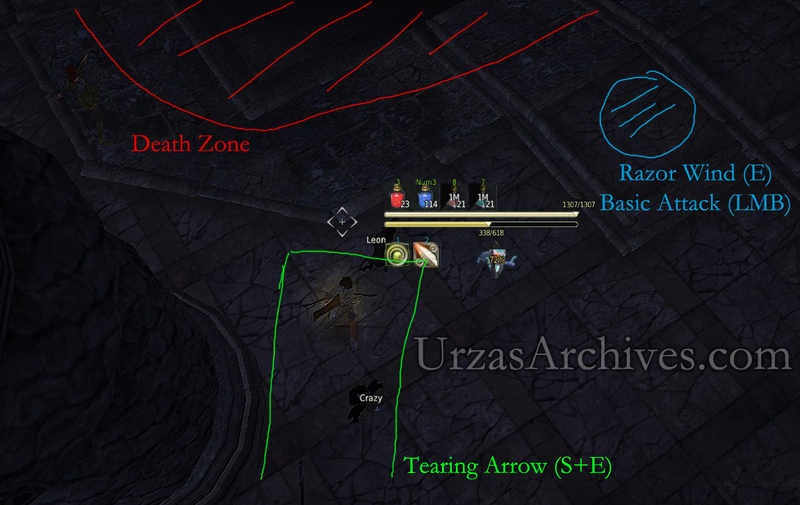 Yet, I have to be honest – for all Field Bosses I do exactly know what to do to get the “big” Loot but Kzarka seems so random for me – I am still checking everything on my checklist but the loot seems rather random for me – yeah I dropped one Kzarka Weapon until now but that was before I started using my checklist (S+E only fight). I am currently trying to find out if Kzarka has more conditions than the Field Bosses for his big Loot to drop! Still once you’re at Kzarka wait until he turns his back and RMB + F him. Directly after go for 3-4 short Bursts of 3-5 Shotguns each. Once you got them through choose one of the four pillars and start your Tearing Arrow. From the pillar position there are only two attacks which can hurt you. His Basic Range Attack will hit you no matter what but the damage is rather low and I normally survive the hit with more than 500 HP (1.300 HP / 128 DP / Elixir of Will). Once you get hit dodge behind the pillar as he often attacks at least twice but standing behind the pillar will render you invulnerable against his damage. His second attack – which will simply one hit you – is a front channel with a freaking long Cast Time. Once you notice that your red crosshair is disappearing while being in range jump behind the pillar. He is invulnerable for the Attack and you might see black smoke all other his position. Do not jump out of the pillar once the animation of the breathe is gone there is some kind if delay / aftershock. Wait for other people to reengage and follow them once you see that it is safe for you.